A warm Welcome to those of you who have visited us for the first time. We are all mourning the loss of the two shops that have closed in the last few months, and hope that we can all fill your needs. Please feel comfortable in letting me know how I can help you with any of your stitching desires, if you are looking for a particular canvas, or thread, we can certainly order this in for you, and if there is any other type of stitching service that you received in the past that you do not readily see available here, please let me know, we will strive to make it available for you. Tuesday morning-11am-until….this group is a needlepoint stitching group-This wonderful group of ladies began as a class, have completed several projects together, and have a great time every week. I am sure if you wanted to join this group, you would be more than welcome. Thursday evening-another needlepoint stitching group-until 7p.m.-this group also arrives whenever their schedule permits, and has a variety of different skill levels. We have often over the years conducted classes during this time frame, so whatever your desire, you are welcome at this time as well. It is a great group, very friendly and welcoming. Saturday-all day-this group-varies during the day-however there is almost always a couple of stitchers here during some part of the day. So if you are free, and want to relax and stitch, this might be the place to come and stitch for a few hours. Or....if you had a group, at one of the other shops and want to stitch here, just let me know, we will make it available to you, that is really how the Monday night group started, so this is a really friendly shop, and we want you to feel comfortable in the space, and take advantage of the great space that we have here. Let me know how I can help you!!! You are welcome any day and any time to come in and stitch, and get help, any day of the week. We have in the past conducted classes on Wednesday evening that may begin again as the weather becomes more like winter and we all want to stay indoors more. Our official hours are here Monday through Saturday- 11-5, with the late exceptions mentioned above, and if you happen to drive by and see my lights on, earlier than 11- which is usually the case, (I am almost always here by 9am), feel free to stop in with questions, or just shop. My motto, has always been, if I am here, I am open. Technically we are past the date, however we are calling my finisher each week to see if they are still taking items, and as of this point, we are. So continue bringing you lovely pieces in, and we will get them back to you by Christmas. At some point what will happen with my finisher, he will still guarantee, the Christmas delivery, he will just impose a Christmas Rush charge. Last year this was and additional $50.00. So for an ornament that will probably cost you a total of $50.00 to finish, paying an additional $50.00 to finish by Christmas, probably not the road you may want to walk down, but for that fabulous stocking, that is critical for you granddaughter or grandson, that you have been working on for 10 years, and the finishing may only be $85.00 initially, maybe it is worth the additional $50.00. Now please understand that finishing a stocking may run higher than $85.00, some run as high as $150.00, but the average for a small to medium size stocking with self-cording, is $85.00. We have a fabulous needlepoint finisher, and great examples here in the shop of the work that he does. He has been in this business for over 20 years and finishes for some of the largest needlepoint shops in the country. Stop in anytime to see those examples, and you can feel free to ask questions about the finishing as well. I just received the next Trunk Show for the year, which is Janet Burnett’s A Collection of Designs. She specializes is smaller pieces, with an emphasis on Halloween and Christmas- As always, I ensure the pricing is great-and the walls will be covered with her pieces. They are already going fast, so please do not wait to come in. I can always special order these, if they arrive during the show, we can guarantee the trunk show price, however if they arrive after the show closes, the price may be at the higher level. We will also have additional Trunk shows booked now through the end of the year-with some great designers. I do have plans to travel, next week, a total of 3 days, and I so hope this will not inconvenience any of you too terribly much. The shop will be closed, next Thursday October 10th, Friday October 11th and Saturday October 12th. All will be back to normal on Monday October 13th. We have the newest purse from Lee, in the shop. This purse has the interchangeable front, and is available in three colors. It allows you to stitch multiple pieces for the front and switch them out as you wish, (seasonally, or as mood hits you). It has been one of the most requested items from all customers over the years, and Lee with their fabulous Leather products, has placed this option on a new large bag, and has also added this feature to other bags as well. Come in and check it out, available in black, lime and orange. We also have a new line of silk ribbons, solid and over dyed, made available by Planet Earth Silk. These are a great value at $4.00/5yd card, vs $6.00 for the competitor brands. I also have a new line of Chinese silk by Indochine, -currently 15 colors, this is a 12-ply, and beautiful-$7.00/ skein. 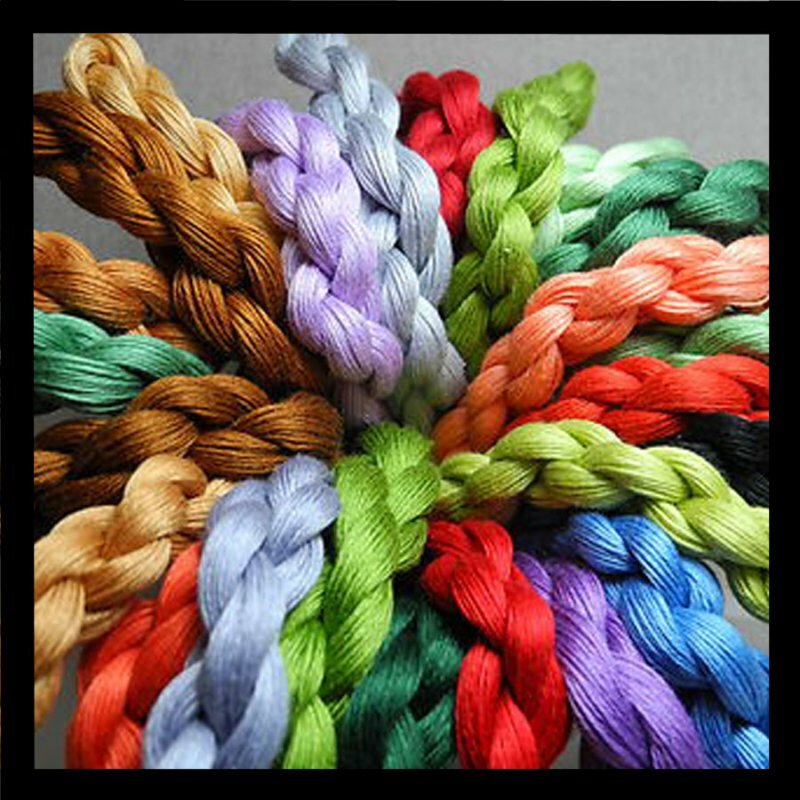 We also have on order some of the new YLI silk fibers from the most recent market, I will let you know when they arrive, they will be over dyed, and an addition to the family of Painters Threads. We have currently the Au Ver a Soie Overdyed Silk, the Overdyed Cotton Broder and the Ribbon Floss Shimmer-all in 27 colors. I am not sure at this point on the pricing. Threadworx also has new colors in the Overdyed floss line, which is here and being put out currently. They are great additions to the blues, reds, pinks and greens. Update to the Paternayan and Waverly ….As many of you know, Paternayan was unavailable for approximately 18 months to 2 years due to the death of the owner of JCA. It has now been back in production for about 2 years, with many delays in the production of colors, from the current production company-Saco River Dye House- in Maine. They have done a great job matching colors, however the actual supply of many of the colors has been slow, causing backorders to be very frustration for customers. They are getting better. In the meantime we moved to Waverly, another three strand wool that was produced here in the US. It was thicker, and softer but received mixed reviews. Colors were different, more opaque. Feedback was that customers either loved or hated it. We did experience consistency problems with the fiber, some hanks were thick and soft and others were thin and rough. The poor quality hanks were returned at the request of the company, however they were not able to produce new hanks that were consistent. As a result, we are returning slowly to the Paternayan. One of the complaints of the former Paternayan was the presence of the Mama, Papa, Baby strand, which left that baby strand so thin it often broke or was un-useable. The new Saco River hanks do not have this issue. The strands are consistent and the colors are consistent, with a few dye lot changes, and we are expecting updated color cards shortly. Pricing is the same as it was with JCA, whereas Waverly just increased their prices. At this point, I would welcome feedback from you, I still have both brands in the shop, and am more than willing to special ordering any of the Waverly in for you. We are known here for our fibers, and I hear from you, I am willing to run with two wool product lines…..So let me know how you feel about both of these lines. If you had special ordered one of these beauties, and have not picked your’ s up, it is here. We do have stitch guides, or suggestions available to assist you with fibers selections. This canvas would also make a great Christmas present for that Harper Lover on your Christmas list.